This is another sauce that was born out of a BBQ restaurant. 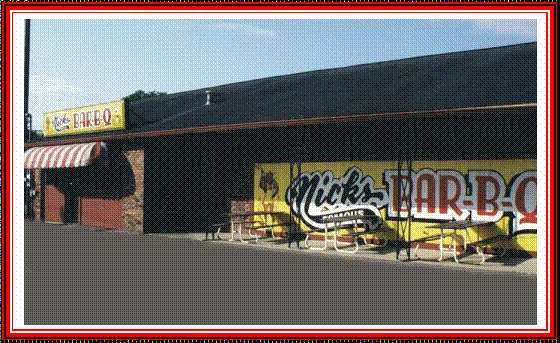 Nick’s Famous Barbecue is located at 2817 Clarksville Hwy., Nashville, TN 37208) and has been around for over 20 years and employs about 13 people. I couldn’t find much of a story behind it on the web, although I was able to scrounge up this picture, courtesy of Yelp. I also found that Ulika BBQ Blog did a nice job reviewing this restaurant a few years back here. Mild vinegar with black pepper & paprika. When I got it and shook it I thought it was a bottle of contact lens cleaning lotion. The temperature changes the thickness of the sauce – warm, it moves like water; refrigerated, it moves like milk. In other words, put it in the fridge before you need to use it… It’s got a nice dark color and has loads of finely crushed pepper. Very simple – 8 ingredients – but why guar gum & sodium benzoate? Just seemed unnecessary for this kind of sauce. Most sauces with a lot of vinegar preserve themselves a bit, no? And the guar gum is used as a thickener, but because this really isn’t a thick sauce, I’m not sure the point in that. Oh well, let’s taste it. Finger in mouth test reveal… hmmmm this is a different kind of sauce. Very mild, vinegar… pepper… salt…. but it almost seems like they forgot to add one ingredient like sugar (that’s because they forgot to add sugar). OK I’m kidding, I know they didn’t forget, they just made their version of a classic Eastern North Carolina sauce. This isn’t a bad thing – hardly ever. I just would have liked a little more flavor variation and complexity. 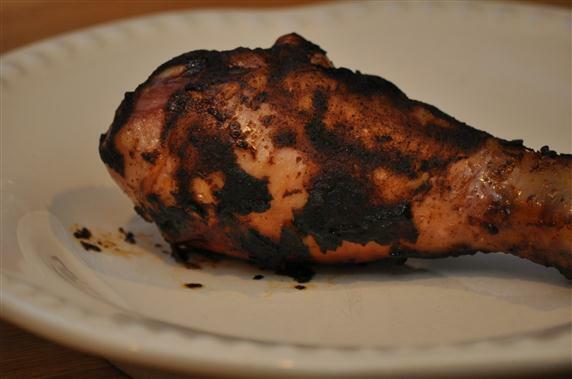 I liked it after cooking, but I think it had more to do with the charcoal / smoky flavors versus the sauce. The taste was very simple – light vinegar, salt and pepper. Very much a simple, dare I say “classic” Eastern North Carolina BBQ Sauce. Personally, I prefer something a little more kicked up such as Guy Fieri’s Carolina #6 Barbeque Mop & Slop Sauce (no I am not paid to endorse that product, just think it’s a better sauce in the category). This is the kind of sauce that would be perfect to compliment a nicely smoked piece of meat. But you really have to have the other parts done right to enjoy your sauce. 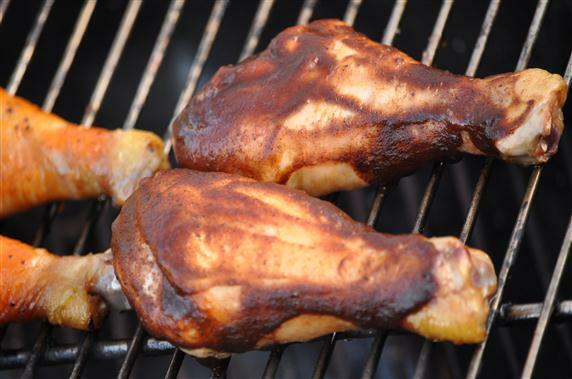 I cooked some drumsticks indirectly over low heat for a long time and ended up with a nice smokey flavor to my chicken – and this sauce complimented it well. But the uncooked flavor and the flavor achieved after cooking hot & fast (i.e. grilling which is about 82.3% of all backyard cooking) doesn’t compare to a lot of other sauces in this category. Please Check Out Nick’s Website (although I couldn’t find ordering information online). Look at the legs on that pig! 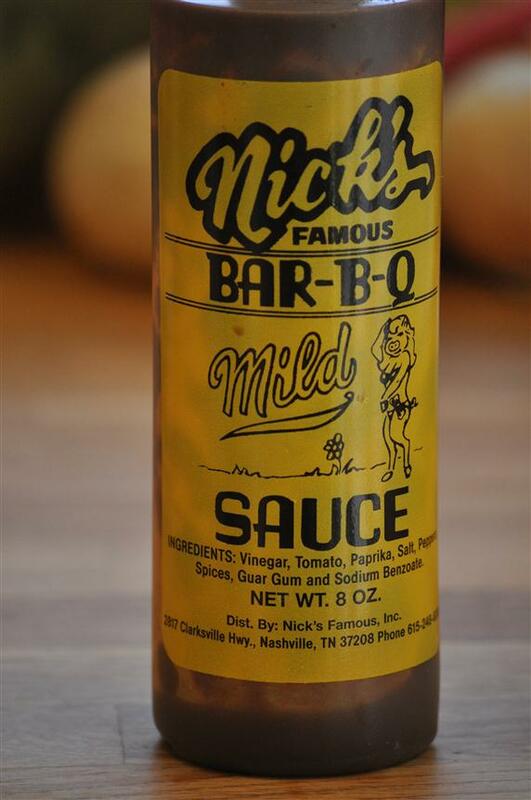 This is my favorite sauce … wish I could get some in VA. I have to go yo ten to get it . I wish it be available in Michigan or on line.